Music is the connection that brought Sally Williams and Mark Minnich together, and it is music that is at the heart of their relationship. The violin performance students met when they were in high school as members of an all-state orchestra. Their initial encounter, however, did not lead to true love. In fact, Williams recalls, she thought Minnich was “somewhat socially awkward.” They met again at a strings camp between her freshman and sophomore years at BGSU and before his freshman year. Eventually, in the small, tight-knit community of the College of Musical Arts, where both were students of BGSU professor Vasile Beluska, they first became friends and then became inseparable in their love of music and their love for one another. 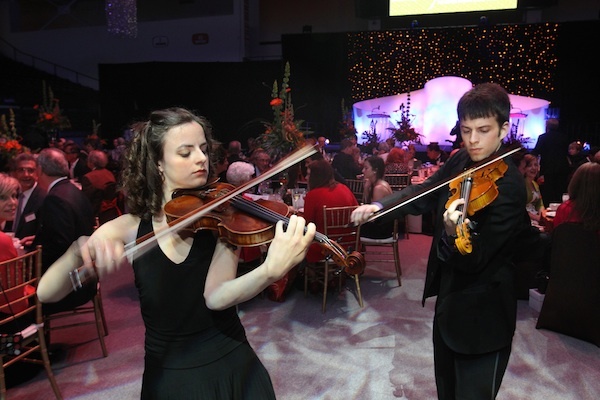 In 2008, they joined musical forces to create Revamped, playing at concerts, events, receptions and weddings. Their performances go beyond a traditional musical duet. Together they bridge the gap between the precision of classical violin and the energy of popular music by incorporating tricks and techniques that mesmerize their audiences. As part of their classical music performances they may improvise by adding an interlude of music from “Star Wars” or “Mario.” Often Minnich will hand his violin to Williams and she gives him her bow. They play the instruments together, with her creating the pitch and him doing the bowing. Their passion for music and one another is visible during their concerts. Williams, who grew up in Elyria, Ohio, started playing Suzuki violin at age 4. Minnich, from Swanton, Ohio, started learning violin at age 9 with Romanian violinist Anca Gavris, before switching to Beluska at BGSU the following year. The talented couple is committed to its music, practicing a minimum of three hours a day, with at least one of those hours dedicated to their duet performances. Like true artists who live and breathe their music, “We never separate our affection from our music. The music seems like a natural extension of our relationship,” she explained. Williams and Minnich are graduating May 4. She will earn a master’s degree, and he will receive a bachelor’s degree, both in violin performance. Beyond BGSU and the College of Musical Arts, they will become Falcon Flames when they marry this summer before heading to Penn State where they will have assistantships to earn advanced degrees. He plans to work on a master’s degree in violin performance, and she will pursue a master’s of education to further her research in the development of a new teaching method for beginner level, post-Suzuki-aged students. “We also would like to continue our duo professionally, as well as performing in other ensembles together. As much as possible, we’d like to not distinguish what we do for fun and what we do to pay the bills,” Minnich said. See them perform during the recent BGSU Leadership Gala at http://www.youtube.com/watch?v=CHUvPOzEWUY&feature=youtu.be. BGSU Distinguished Artist Professor Dr. John Sampen was recently awarded an “Honorary Life Member Award” by the North American Saxophone Alliance. This professional organization (NASA) represents the only national association for concert saxophonists in the USA and Canada. Sampen’s “Honorary Life Membership” is distinctive and prestigious; indeed, during the last forty years, only twelve saxophonists from all over the world have been so recognized by the Saxophone Alliance.